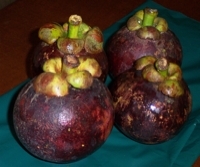 The mangosteen (Garcinia mangostana L) is perhaps the most treasured of the tropical fruits, and virtually unknown in the US except among those fortunate enough to travel abroad. They're not legal to import to the US because of concerns about fruit fly infestations; but you can find them on the street markets in Chinatown in Toronto. It's an exceptionally attractive fruit, with a thick, royal purple skin and a tomato-like green stem up top. Cut it open and you'll find white flesh, ivory-white, with almost an iridescent pearl like sheen. Foodies love to crow about the indescribably orgasmic flavor which is incomparable to anything else in the world, but they're just being drama queens: mangosteens have a papaya and grape sweetness, with a refreshing lime-like acidity. They are juicy enough to make a copious supply of napkins a requirement. There's mystique surrounding the mangosteen, and it's hard to separate fact from fiction. Folklore holds that Queen Victoria offered a knighthood (unclaimed) to anyone who could bring her back an unspoiled one to try from the Indies. It also holds that it was her favorite fruit, a somewhat incompatible notion. Perhaps derived from this story is the unofficial designation of mangosteen as the "Queen of Fruits," which sounds great until you realize that the smells-like-vomit durian is the "King of Fruits." 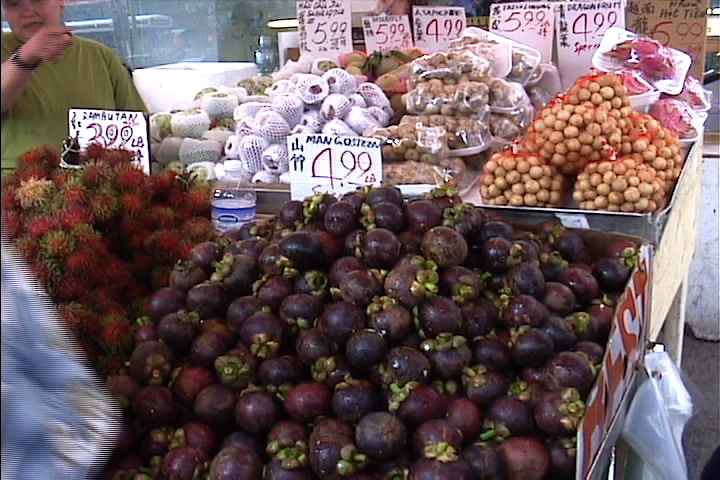 I obtained my mangosteens from one of the Vietnamese open-air markets on Spadina near Dundas. While there, I also picked up some rambutan, sugar apples, rose apples, and passed on the dragon fruit and fresh lychees. They are conveniently located near many shops where you can get a Saigon sandwich. Basically, this is where you go when you die, if you're good. I'm always surprised that more of these hyperperishable tropical fruits don't end up in preserved (or preserves) form; although of course that does violence to the fruit in its fresh form, it's better than nothing. Some detailed horticultural information on the mangosteen. Jeremy at Frost Street (a food-obsessed site I heartily recommend) was overwhelmed by his mangosteen experience in Italy (more by the fact that he had one than by the quality of the fruit itself). I hope if he takes the short jaunt up to Canada, he tries a fresher one. R.W. Apple of the New York Times wrote a travelogue discussing his love of mangosteens. Does anyone have any doubt that if he could get one any time at the corner store he'd transfer his obsession to some other form of unobtanium?